A brown book cover with a 70's vibe splashed all over has a triangle shaped tear on the cover and a worn spine from being furiously rubbed over the counters of a kitchen. These are all the signs of a well loved and stand-by cookbook. Never before have a recommended a cookbook so highly. But you ask what is this ethereal creature a speak of? It's a book, no it's a cookbook… no no, it's a bible. A bread bible - The Tassajara Bread Book. I had written about my whimsical tale with said aforementioned book in a much earlier post, but credit should be given where it is due. I was a horrible (well, not "burnt to a crisp" bad) bread baker before I got this book. As a frame of reference, this was my sophomore year of college and this was my first time with my "own" stove. 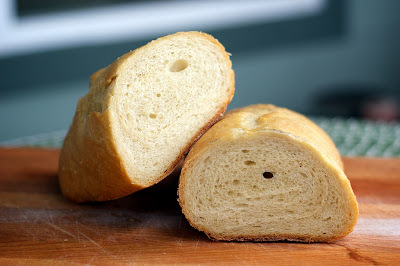 I'm probably being a little hard on myself (in the kitchen, I'm only mildly a perfectionist), but my bread never turned out how I wanted it to… or how well my friend Brendan Carson's did. Or how well my ex-boyfriends dad's did. Brendan's bread was always so rustic; freeform shapes, thick swirling crust and the perfect amount of air holes. His bread doesn't even compare to Mr. Seidel's Sourdough, I loved it to it's very crumb. I would marry it if I could. These were my bread baking hero's… and what I instantly wanted my bread to taste like. As you can probably guess, mine wasn't like theirs. It always seemed to have too strong of a flour taste, the crust was weak and the loaves never rose how I wanted them to. Being the good boyfriend that he was, Alex sense my frustrations and had the perfect solution. One day after class I was sitting in his bed, hiding away from the creeping cold that is Michigan winters, and he walked in with a little present for me in his hands. He said his dad used it and it should help me. Being that I'm a girl and that anything that is wrapped, even mildly shiny and (for me at least) is in the shape of a book, I instantly knew he was about to get some major bonus points. Tearing off the secular holiday paper I started the best relationship I ever had… with a cookbook. Looking at the shelves now, I have my fair share of cookbooks. Some get used a few times a year and other are used so frequently they are never are the shelf. Some are big and have glossy sleeves to their hard covers while others are floppy paperbacks. But The Tassajara Bread Book is no doubt the smallest yet probably the one that has the most amount of notes written in the margins, tears and dog ears littering the pages. P.S. Alex, you still, to this day, get so many points and I think of you every time I use this book. I am so grateful you gave this to me - I made me the (if I don't say so myself) pretty spiffy bread baker that I am today. If anything, you'll have more recipes like "A French Bread" that I made for the 437th time a few weeks ago. Every Tuesday night I truck over to West Seattle to watch Glee with Julie and Katrina at her parent's house. Usually we don't do much before hand, but this time we decided to have a traditional sit-down-with-parents dinner. We all brought a different element of a meal - as you can probably assume, I brought the bread. I choose to make this loaf mainly because I just love this bread. I love how the crumb swirls within the loaf, how it toasts perfectly, how it makes the greatest french toast ever and … well… HOW QUICKLY it rises. I mean seriously, two loaves of bread that is perfect for sandwiches but also impresses dinner guests that can feasibly be made in a afternoon? Do you KNOW how rare that is? As you can tell by how I'm spazzing out, it's pretty rare and pretty awesome. Don't believe me? Try it yourself!! Dissolve the yeast if the water until bubbly, about 5 minutes. Stir in the honey until well combined. Stir in the initial batch of flour one cup at a time and beat for 100 strokes with a spoon (this is according to Tassajara, I stick it on my stand mixer with a dough hook & knead it for a little bit). Let rise for 45 minutes, or until doubles in size. Fold in the salt, making sure not to tear the dough. Fold in (again, I knead in using my stand mixer, but don't think I haven't made this completely by hand before) the second batch of flour one cup at a time until the dough comes away from the sides of the bowl. Knead, using additional flour as needed, until the dough no longer sticks to the board and is smooth (this will take about 10 minutes). Let rise until doubled in size, about 50 minutes. Punch down. Let rise again until doubled in size, about 40 minutes. Shape into two loaves by flattening them out into a large rectangle then rolling them up tight like a rug. Pinch the seam into the loaf and place seam side down. Place the the loaves on a baking sheet that has been sprinkled with cornmeal. Let them rest for about 20 minutes. Brush with water. Bake at 425 degrees for 10 minutes and then spray the loaves with water. Continue baking at 375 until well browned, about 35-45 minutes. As soon as the loaves are removed from the oven, brush the tops with garlic butter. I am not that good at making bread yet. For some reason my breads come out pale and then are hard as a rock. I think I will get the book you suggested :). 2) you're not alone in idolizing brendan's ability to bake bread, or for me - to be the most haphazard yet amazing cook ever. he can turn what seems like nothing into something delicious. the random things left when you really need to go shopping can always be turned into an amazing meal with him around. 3) im way closer to seattle now than i was yesterday! I could seriously use all the help I can get in the bread baking department. Christina - SO EXCITED FOR YOU TO ARRIVE ON MY DOORSTEP!!! Thanks for the book recommendation. I checked and the King County library has one copy of the old 1970s book so I opted to reserve it over the 1995 version just for the authentic feel. My favorite cookbook of all time was my mother's Joy of Cooking cookbook from the '70s which was so used it eventually fell apart and was lost. The new ones just aren't the same (both in feel and content).